I have to admit that I enjoy being on the Seine River. The scenery is beautiful. The wide-open river allows us to travel faster. The locks are much further apart, and much larger. We were just in a lock with six barges. It was a little scary, though in the end everything worked out okay. The towns have been a little larger than I like. I suspect that as we get further from Paris they will shrink in size and take on more character once again. The Seine just outside of Paris. 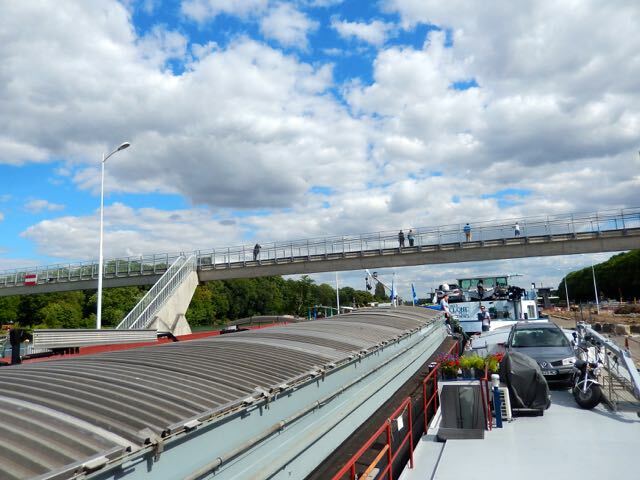 Rabelo spent her first night on the Seine moored in Melun. 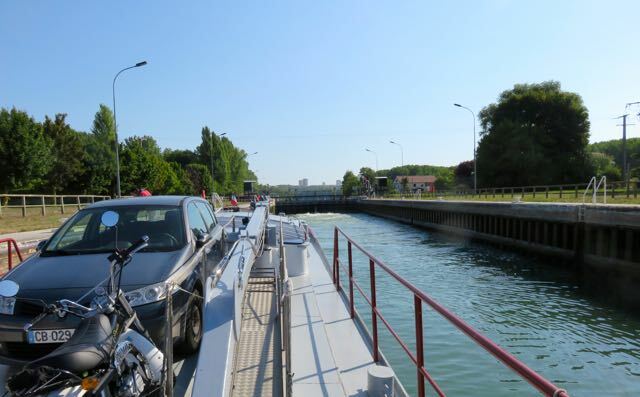 Even the giant locks on the Seine can get a little tight with six barges. Our second night on the Seine had us stopping at Samoissur Seine. It was probably fifty miles up river from Paris, and absolutely delightful. It didn’t hurt that we parked literally next to an Italian restaurant’s patio that hung out over the river. Under the heading of small world we bumped into an old friend that we had meet when we had our last barge twelve years ago in Paris. Steve has always been quite the character and we had a fun time with him and his girlfriend Kay. Mooring along the Seine can be difficult. There is so much traffic, and the large barges tend to kick up some pretty good size waves. 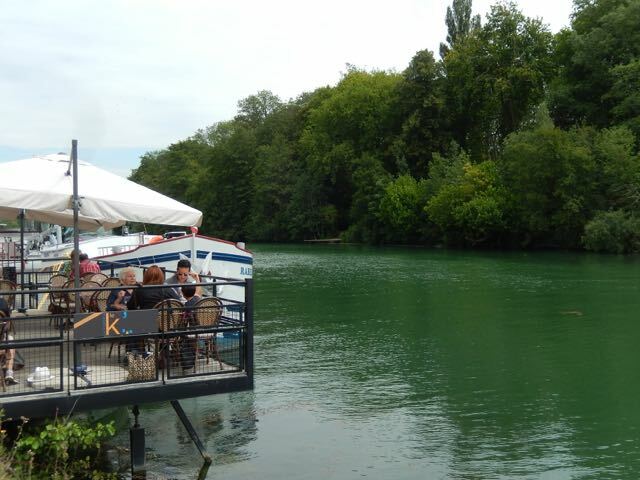 Fortunately a small tree covered island protects the anchorage at Samoissur Seine from the wakes generated by all the barges. 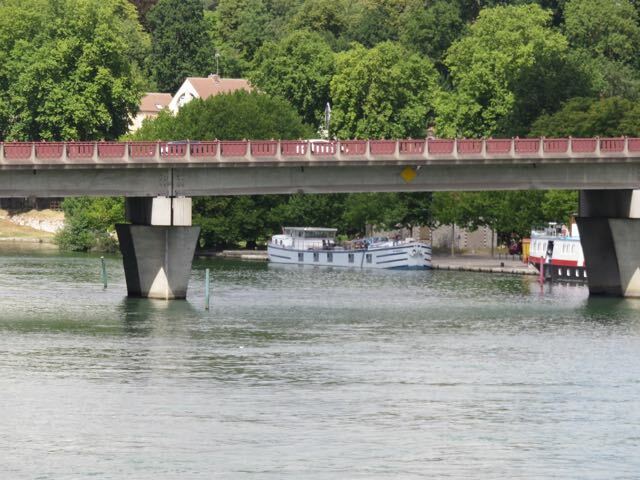 Rabelo moored in Samoissur Seine. Our next stop was Moretsur Loing (Moret). 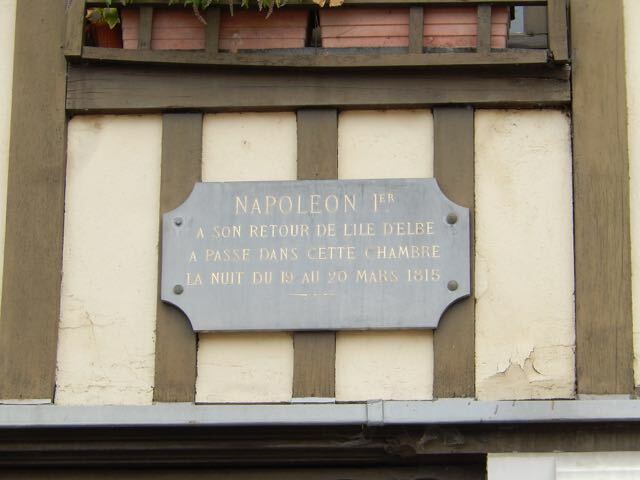 This was the beautiful town that Lisa and I drove to about a month ago where the painter Alfred Sisley lived. 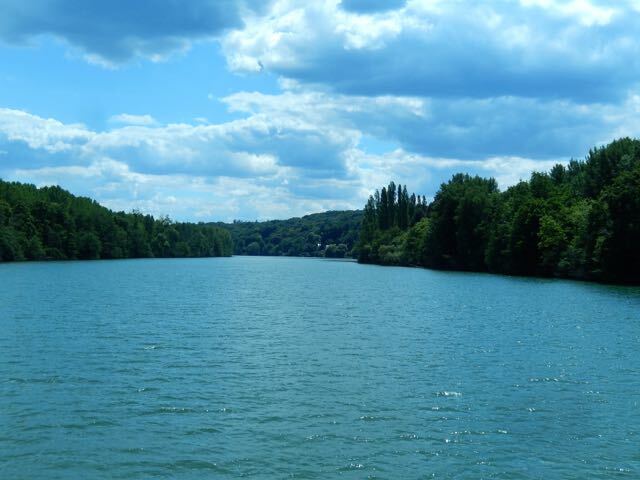 It is only about a half mile up the Loing River from the Seine, so it really wasn’t very far out of our way. We bumped into our friends Amanda and Pete on their boat Piglet who we meet in Nevers earlier this year. The bond between boaters that are cruising is much different than what we find at home. Pete recognized Rabelo, walked up to Lisa and gave her a big hug. Even though we had only met once before it was like being with long lost friends. Frankly, unless you have tried cruising it is a bit hard to understand. We spent the weekend in Moret, which gave us a chance to explore this beautiful city. 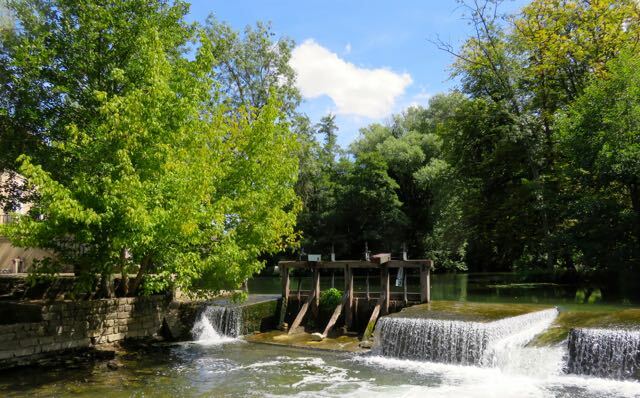 It is the kind of place where you would typically not spend the night, but rather make it a day trip from Paris. We loved spending the weekend there. While we were in Moret my watch died. 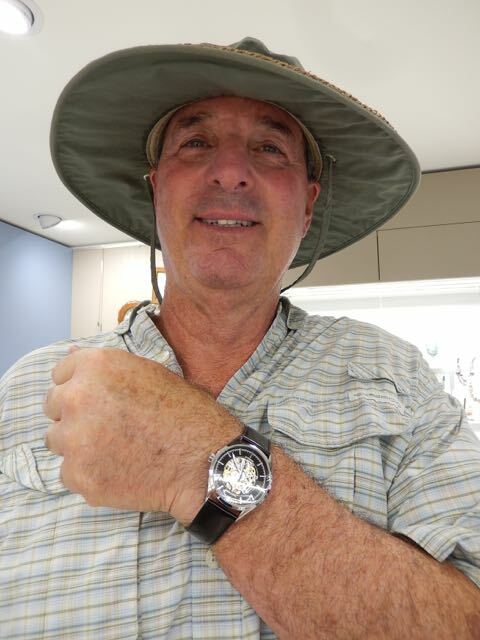 Kevin found a watch shop that would replace the battery for only eight Euros. We dropped off the watch, and the very nice lady said we could pick it up in fifteen minutes. We walked around town for a while, bought an ice cream cone at an excellent ice cream shop, and then went back to pick up my watch. While Lisa was paying the bill I stepped outside, and just happened to glance at the display window. I’ve had my fifty-dollar Timex for six years. It still keeps perfectly good time, and there wasn’t any reason to replace it. One particular watch caught my eye. It cost more than the Timex, but was still very reasonable. I made the mistake of showing it to Lisa, and the next thing I knew I had purchased a new watch. This was a big deal for the Miller family, as I never buy anything for myself. My new watch. Now all I need is a new hat. Rabelo in a giant lock by herself.